Teaching Undergraduates: Since 1996, I have had the privilege, honor and pleasure of teaching university undergraduates in a blood diseases biology course. I say privilege and honor because I really do mean it, being able to teach, being afforded the opportunity to teach students is to be cherished. My medical school colleagues all wonder when I say it is my privilege to be able to teach this course. Is it worth it? Yes, this class is a part of the fabric of my Carolina life and times, and I wouldn’t change it for anything. Building Bonds With Students And Supporting Their Future Endeavors: Outside of class, students enjoy talking, getting advice, and sometimes they just need a soundboard to test an idea. These student visits are in person, by email, by phone, by text, or by whatever means is available. It requires that you process the “story” and respond with what you believe to be true, but mostly, it requires time. Students are truly seeking life- and career-advice/wisdom, they soak up your words like a dry sponge does water. These conversations over the years have become a very important part of my academic career. The majority of the undergraduates I teach are interested in health care careers (Medicine, Dentistry, Physician Assistant, Nurse, etc. ), graduate/professional school (life sciences, public health, law, and business), and there are always some that are undecided (my favorite group because that was exactly me at 22 y.o.). Conversations with students can continue for years as these transitions occur, always wonderful fun to see their growth and maturation. Many of my generation worry about the ‘potential’ of the current generation in school. If they would take time to listen and talk to these “kids”, their worries would melt away. 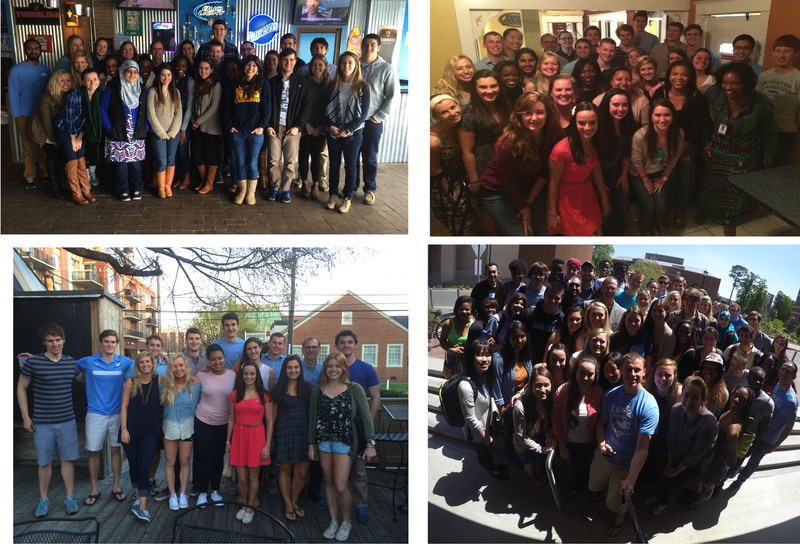 These students have amazing potential and unlimited passion for life and others. Sharing The Story Of My Parkinson’s Diagnosis: I decided this spring semester, a year post-diagnosis, that the undergraduates deserved to hear my story. 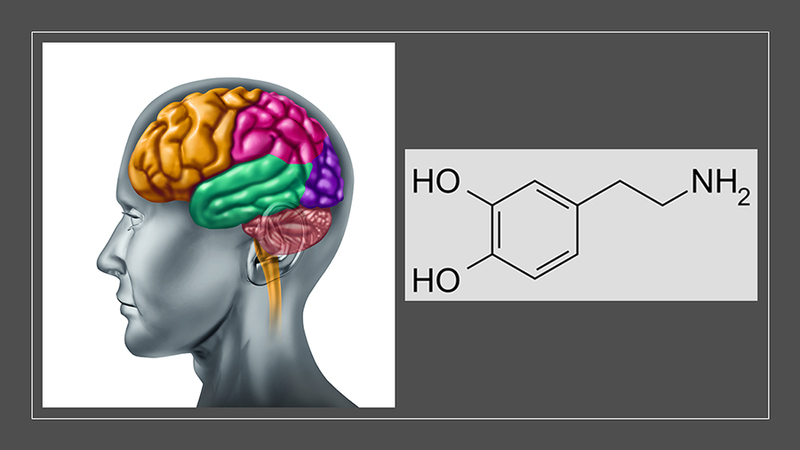 For many, it was an email/text that started with the picture(s) of my dopamine-tattoo, followed by the reason why, my future life/work-plan, and a link to this blog to follow the journey (if they so desired). I contacted the current and past 2 semesters, told some students in person, others heard by text message. “Dear Frank, I am touched that you decided to share your blog and your “good news/bad news”. Our health problems are very close to our hearts as individuals and I know how vulnerable it can feel to let them out into the open. First of all, I am relieved that you finally have a diagnosis for the past 3 years of frustrating and mysterious health issues…but I’m also very sorry and I wish that Parkinson’s had decided to affect anyone else but you. Of course, in true Frank fashion, you’re adding a zippy soundtrack to the situation and turning this into an amazing educational opportunity with your blog and your future patient panel with us. From your posts so far, I can tell this site going to be an invaluable resource for others who have been diagnosed with Parkinson’s. You’re going to impact a lot of lives with this courageous step of revealing your diagnosis, in a powerful combo with your skills as an educator. Does the Isradipine mean you are participating in a clinical trial? I’m eager to continue reading your blog and follow up on all of these articles on current research and theories on how to best delay progression… it sounds like there is a lot of hope with this disease for new treatments. Please let me know how I can best support you, and know you can call anytime if you need something. Coffee run, tennis partner, dinner take-out on the bad days, seriously anything. One thing I can contribute–you mentioned meditation… you’re probably already better at it than me, but I recently picked up a true gem of a book that you might enjoy. “Guardians of Being”, words by Eckhart Tolle, illustrations by Patrick McDonnell. “Frank, on Saturday after second look I talked to my parents about you. I told them that the biggest factor for me considering coming to Carolina was you. I told them that I had found a rare professor, mentor, friend, that had impacted me in ways that I could never explain in words. It was such a rare thing– to find someone who didn’t just alter my experience in academia, but in my fundamental perspective and outlook on life. That was you. On Saturday, I told my parents the only SINGLE regret I had during my time in chapel hill was that I hadn’t met Frank Church sooner. Frank, you are such an inspiration to me, and I know to so many other students here. You are simply put– an incredible human being. You’re like the real living superman (minus the tight-fitting spandex outfit). I read some of your blog just now and have found it to be insightful and transformative. You have a rare gift for this. And I am convinced it is for a reason. I can’t wait to see the difference and impact you make in so many others through these coming years. I truly wish you the best and have no doubt that you will give this disease one hell of a hard time. “Frank, wow! Sounds like you have been through a lot in the past couple of years with this “differential” diagnosis (learned that from you), it is admirable how persistent you were in trying to figure this out, as I’m sure many would have lost patience. Now I hope since you have a diagnosis that your being proactive will be a big benefit to helping reduce the symptoms. I truly am saddened and sorry to hear this news Frank, but what I know of you, you always manage to make the best of every situation and find time to enjoy life and have fun, and to make sure everyone around you is doing the same. I’m glad to hear your positive attitude despite the circumstances. You are in my thoughts and I hope and look forward to keeping up with you through your blog and texts, etc. Thanks for sharing your quotes, I know my dad, who you remember is a philosophy professor, was very influenced by Viktor Frankl’s book about life philosophy. I’ll leave you with one that I have hung up on the wall in my room is “begin each day with a grateful heart”. Simple but a nice reminder to focus on the good things. 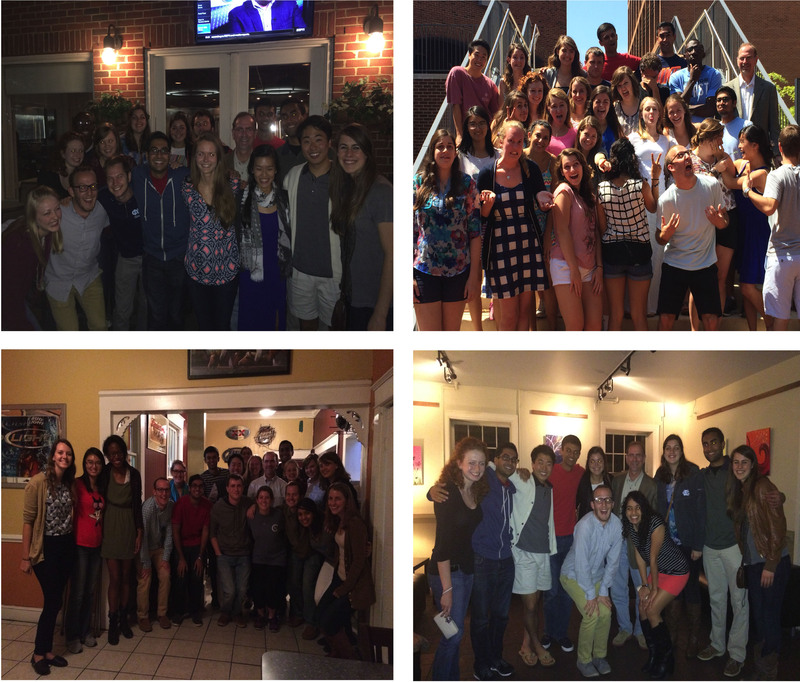 Pictured below are the Spring 2015 and Fall 2014, respectively, class members at various events. Frank – you are awesome! How lucky and blessed all of your students past, present, and future are to have the opportunity to learn from you. I am inspired by your posts every week, you are a true Carolina gem. As one of these “undecided” 22 year olds, your class was the one that really sparked my interested in the biology of disease. I truly wouldn’t be where I am today without you Frank, thank you for your wisdom, for believing in me and every student you so graciously took the time to speak to, listen to, and give advice– you are a very special mentor to many. Most of all, you gave me the courage to pursue biomedical research and go to grad school, and showed me that science (& scientists!) can be fun. Thinking of you and thankful for you always. So glad you are sharing your story.